The Blazers defeated Ferris State 49-47 on Dec 15 to win fourth national championship. 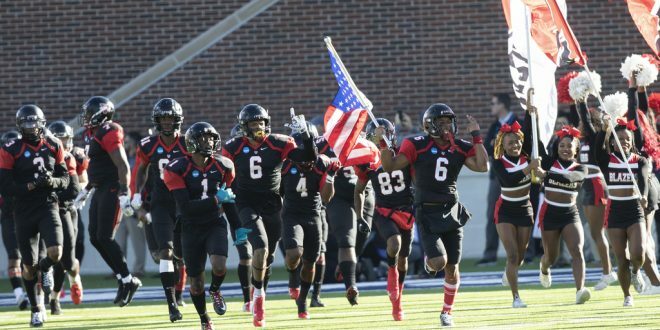 Your National Champions, the VSU Blazers, will be celebrating their historic season this evening in The Complex. All students and fans not enrolled at VSU will be able to attend the celebration of the first undefeated team in school history for free. It’ll start with the Blazers being escorted by VSU’s police department up to the bridge on North Oak Street. From there, the team will take its first Blazer Walk of the new year as players make their way into The Complex. In the ‘Plex speeches from players, coaches and community leaders will be just one of the many aspects to look forward to. There will be live music, food and drinks to enjoy along with face tattoos. To top it off, the team will host an autograph signing, and merchandise will be available to purchase as well. It was an unprecedented year, but what many people don’t see is what goes on behind the scenes of gameday. It all begins in the spring, where players work tirelessly to perfect their craft up until fall. Fall isn’t any easier, though. Early morning weight lifting, long practices and balancing classes is what these student athletes endure every year. In addition to being guided by a head coach in just his third year in the program, the football team was heavy with underclassmen. But with much hard work, 2018 ended with a perfect 14-0 record. So, these VSU Blazers are more than deserving of an unforgettable celebration. They gave fans an amazing experience, and it’s only right that they receive a blowout celebration from the community. Doors open at 5:30 p.m. The celebration takes place from 6-8 p.m.
Be sure to come out and help pack the ‘Plex for your 2018 National Champs! Written by Josh Miller, Social Media Editor. Photo courtesy of VSU Athletics.